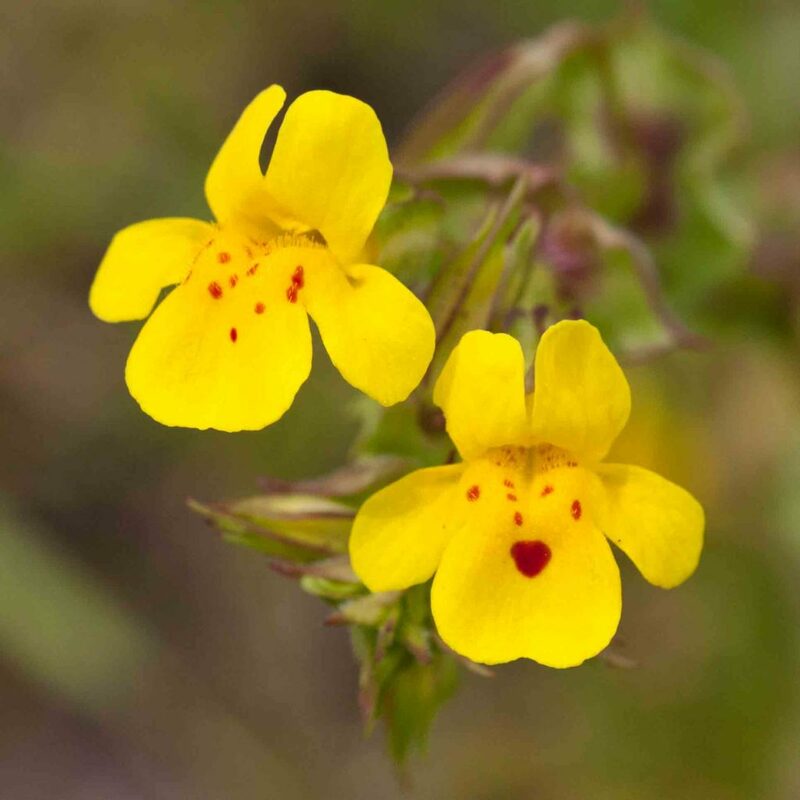 Monkeyflowers used to be treated as Mimulus but recent scientific literature has divided them between two genera, Diplacus and Erythranthe. 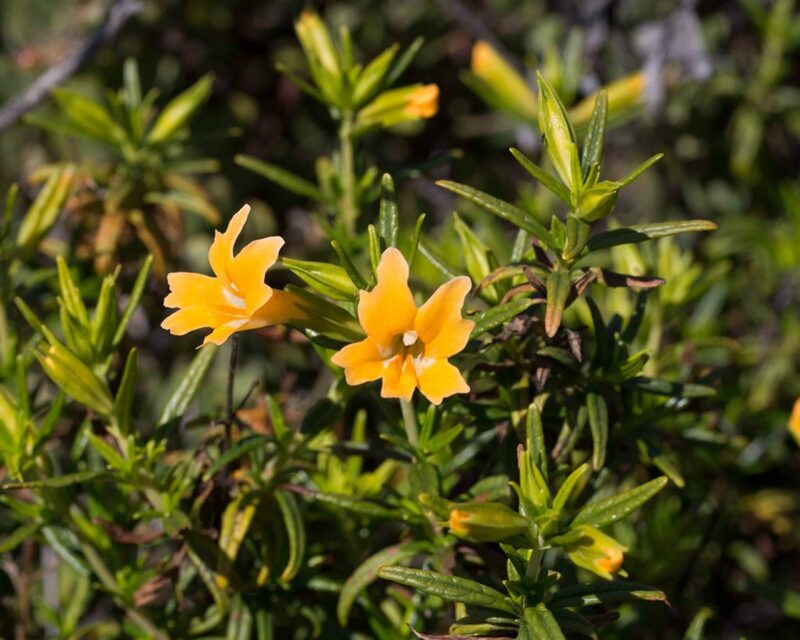 Diplacus (which include but are not confined to the shrubby monkeyflowers) are characterized by flowers which are either sessile or have pedicels shorter than the calyx and which are persistent (remain attached) after flowering. 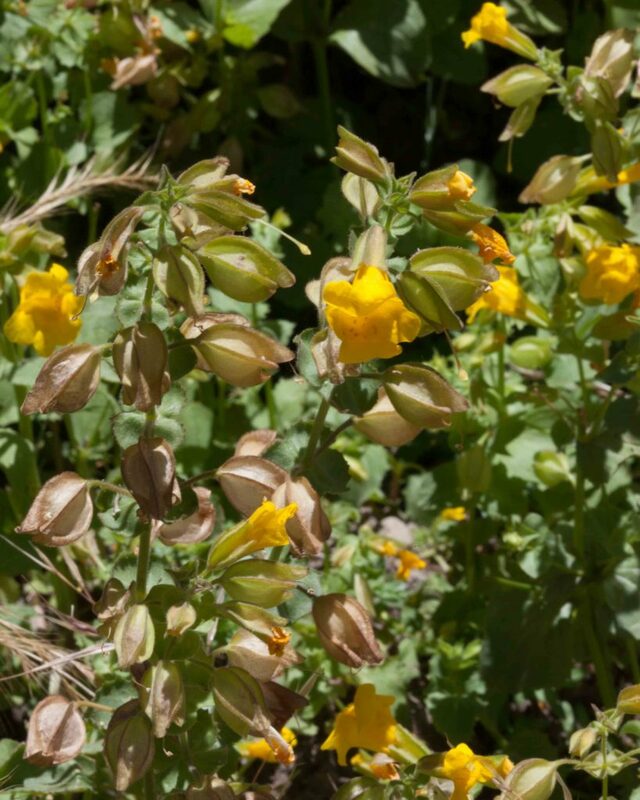 Erythranthe have flowers with a pedicel longer than the calyx and which are deciduous (fall) after flowering. 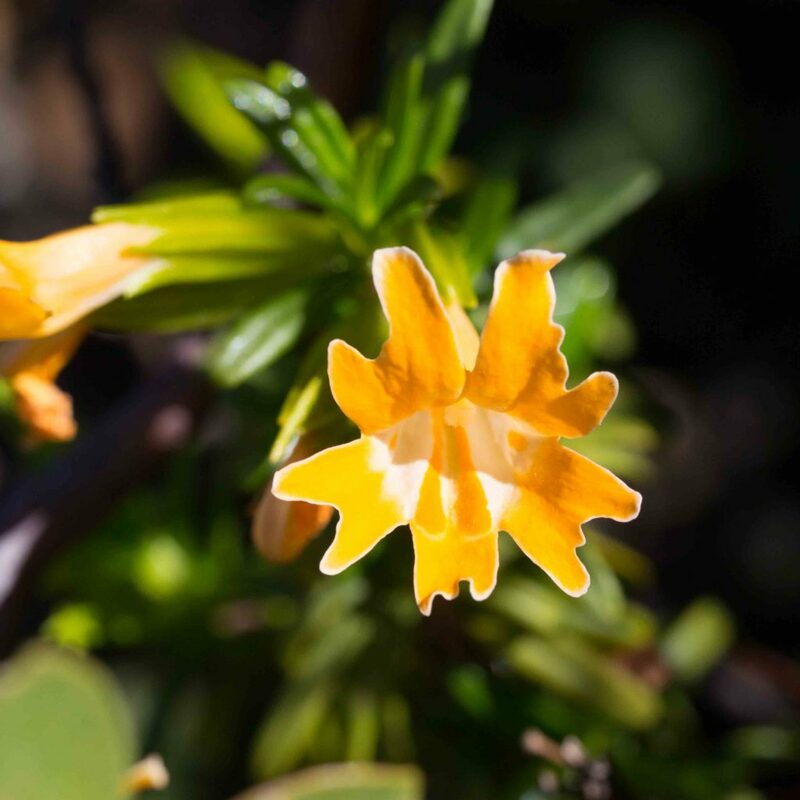 Both Diplacus and Erythranthe include plants with comparatively large yellow or orange flowers and plants with comparatively small magenta to purple flowers. 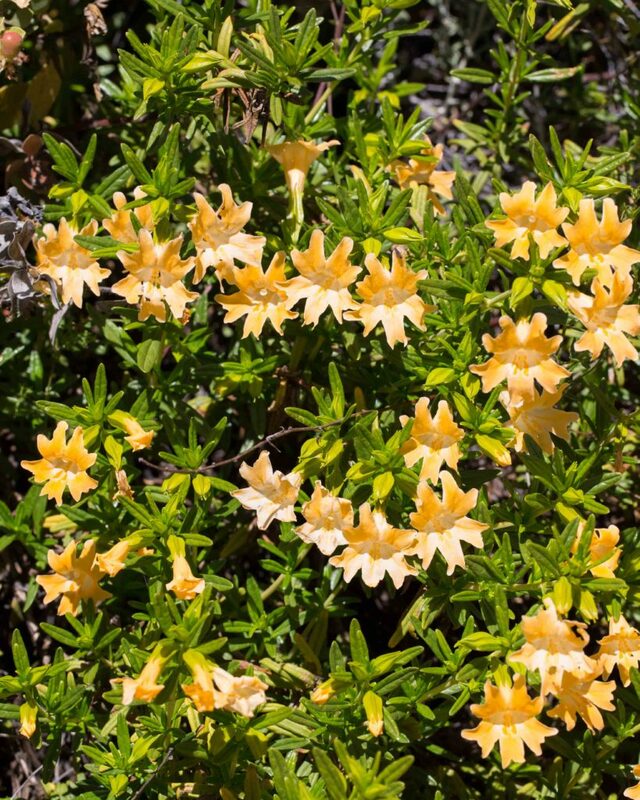 This is an extremely common shrub, especially in the Outer Coast Ranges. 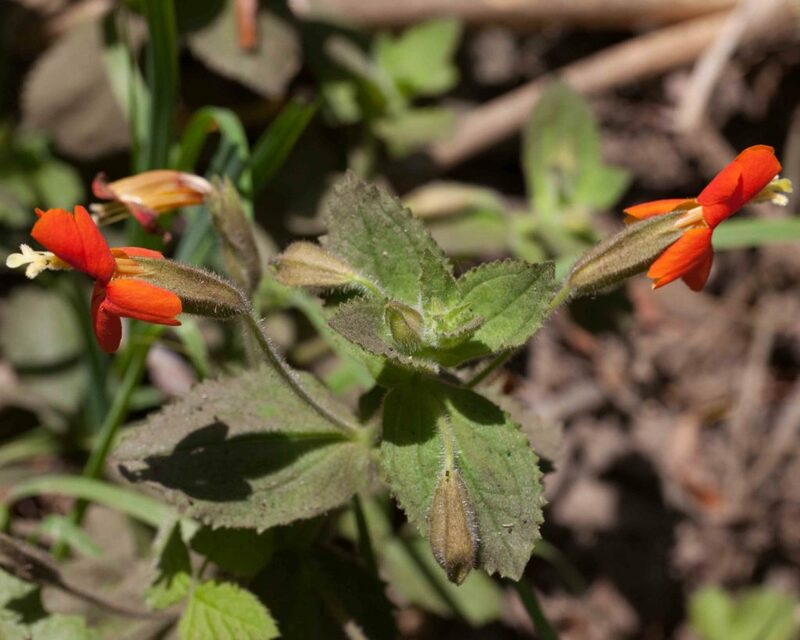 It is immediately recognizable with its bright orange flowers, generally arranged in pairs. Leaves are dark green, opposite and elliptic to linear. 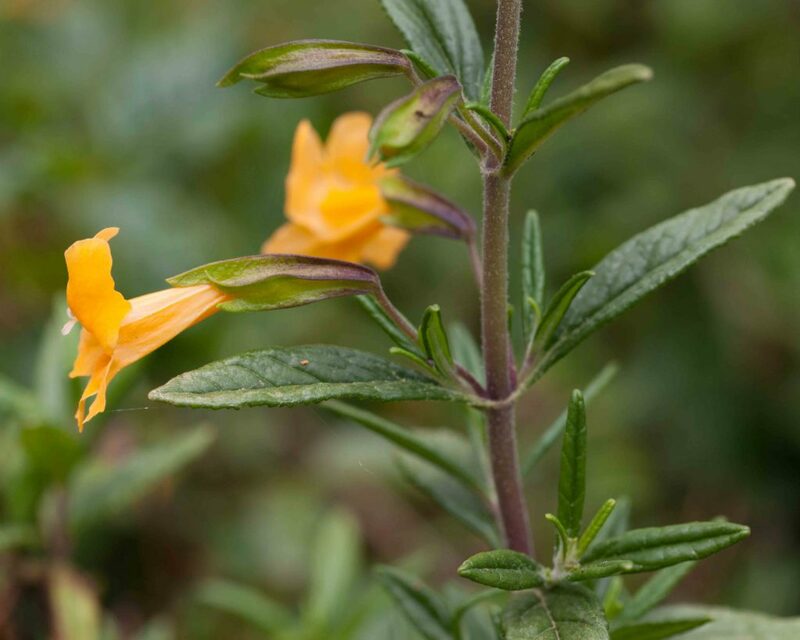 Stems, leaves and calyxes are sticky to the touch. 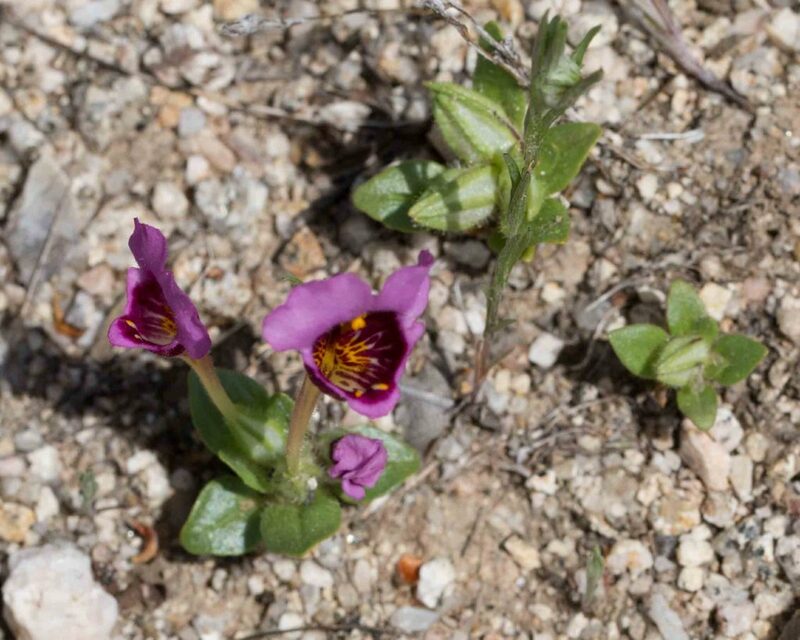 Flowers are either sessile or short-pediceled. 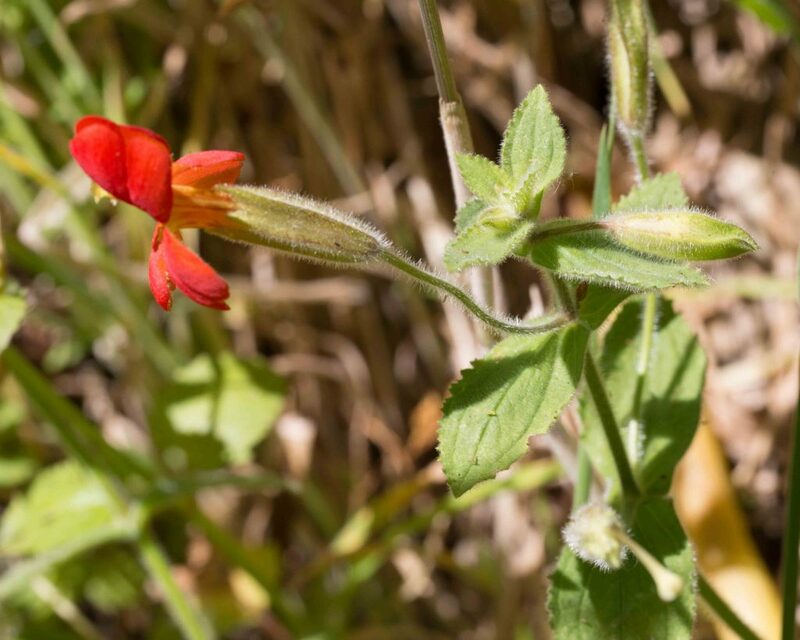 Common in the Santa Lucia Mountains, generally at higher elevations. 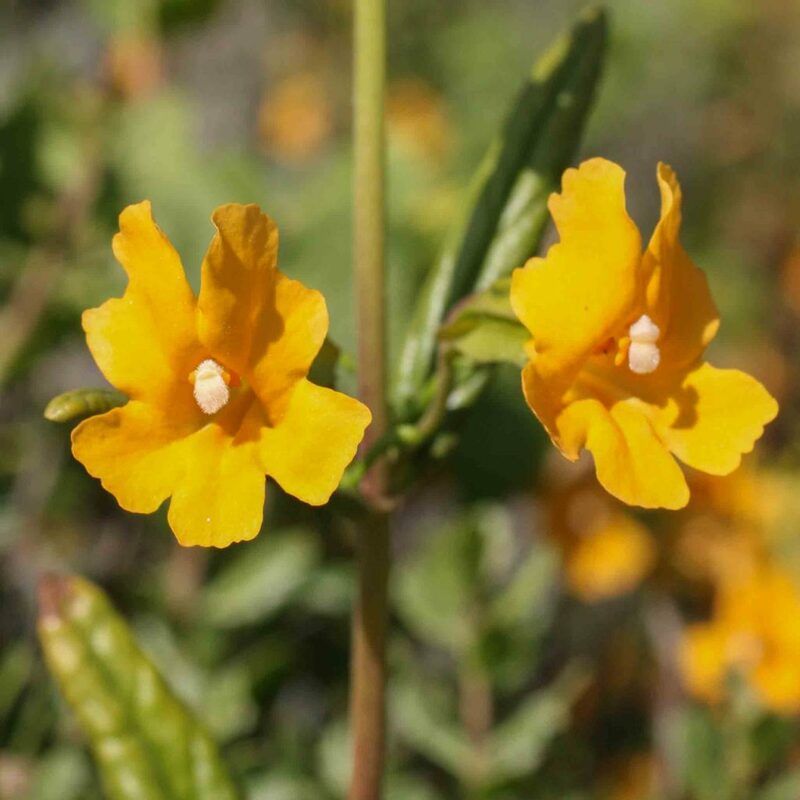 Similar to Sticky Monkeyflower (Diplacus aurantiacus), it can be distinguished by the prominently notched lobes of its flowers. 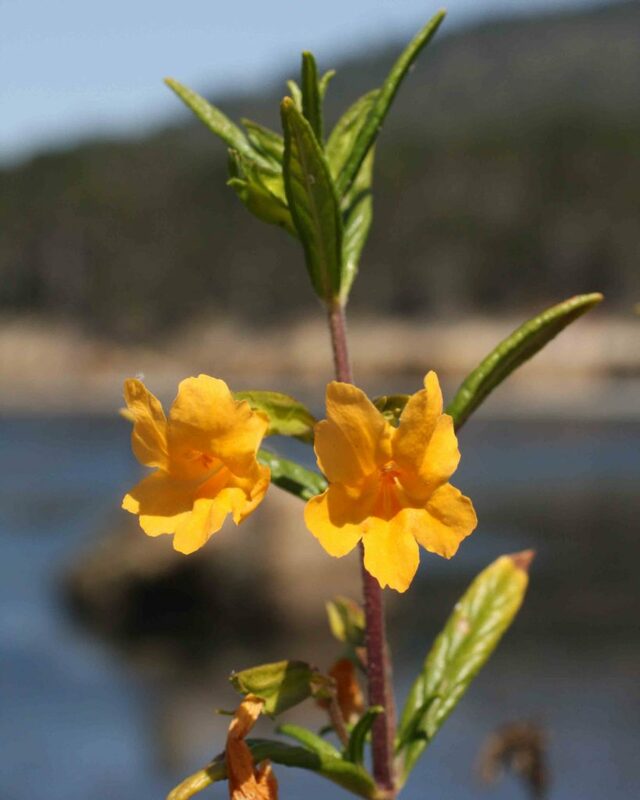 The flowers are a little larger than those of Sticky Monkeyflower and tend to be paler, varying in color from orange to salmon or pale yellow. 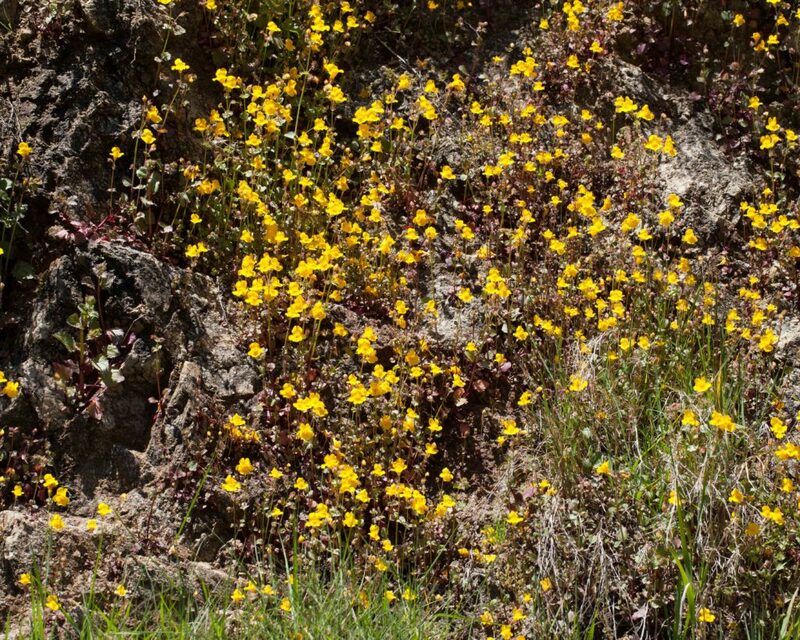 The leaves are linear-lanceolate. 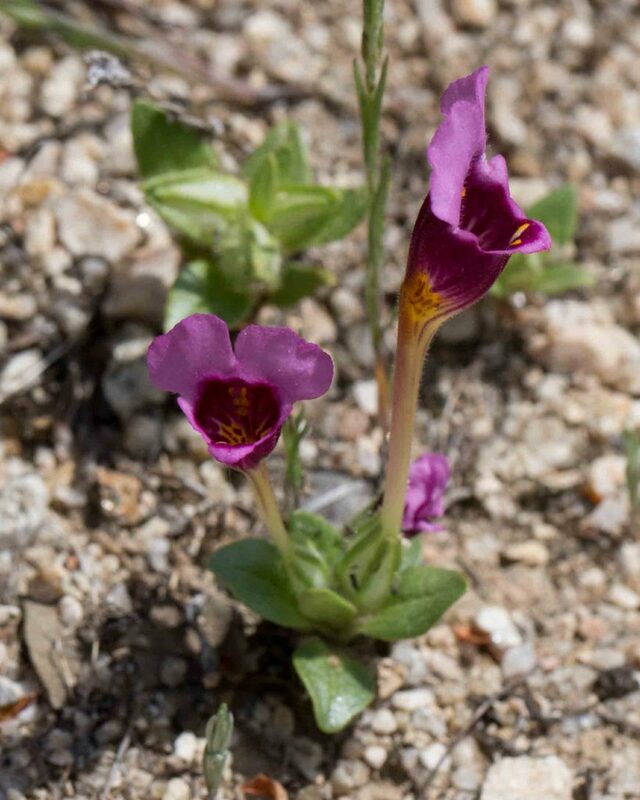 This common name of this diminutive monkeyflower fits beautifully the shape of its magenta to purple flowers with their gold-streaked throats. The lower corolla lobe is more or less vestigial, in striking contrast to the eponymous upper lobes. 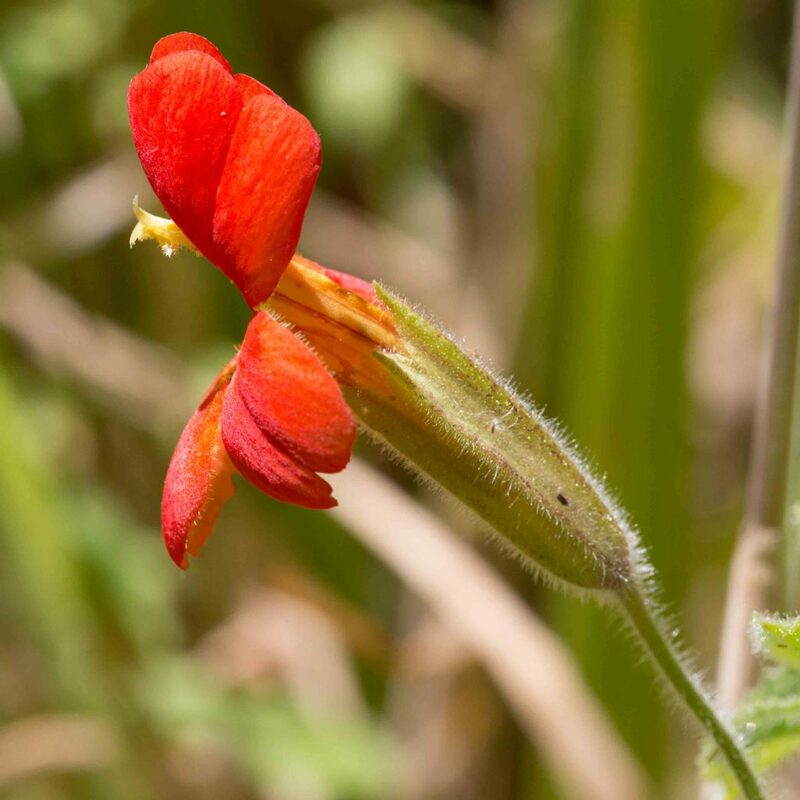 Note the long flower tube and the short pedicel. 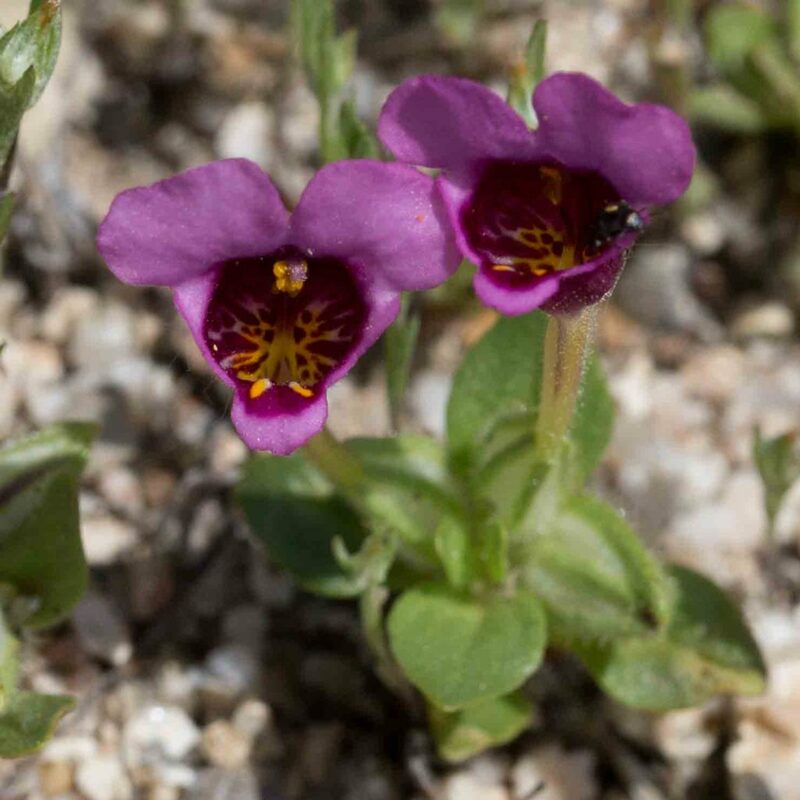 This monkeyflower has particularly small flowers with a red-purple or rose corolla, 4–7 mm wide with yellow folds at its mouth. 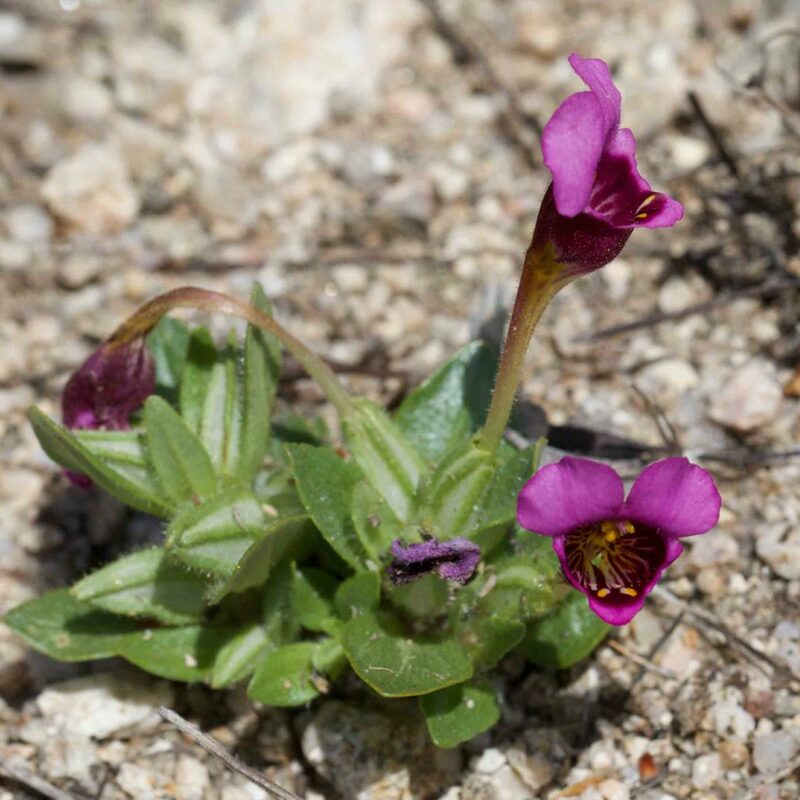 The upper and lower corolla lobes are not noticeably different in size. 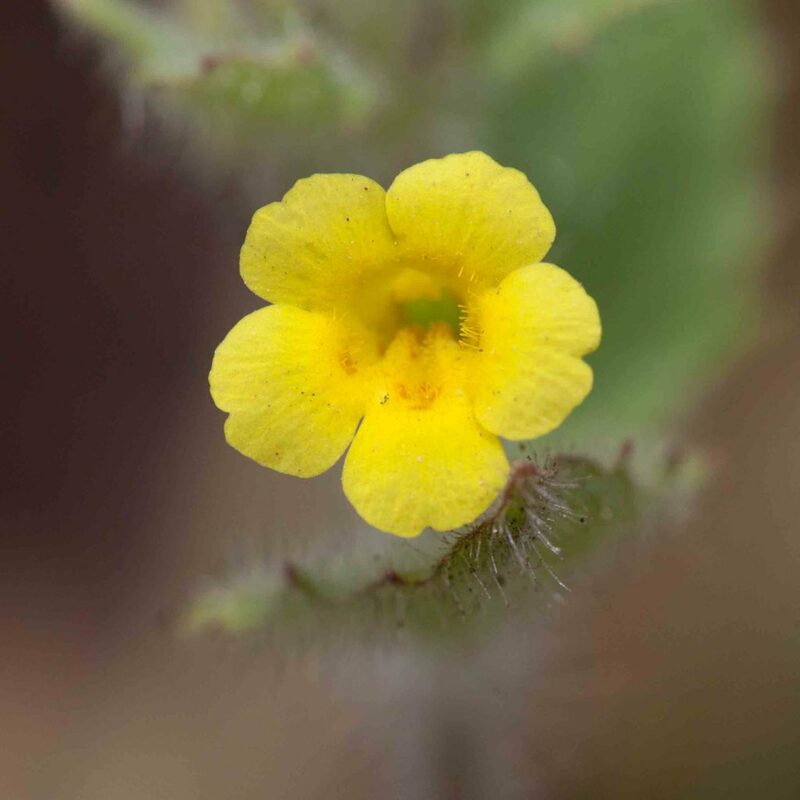 The small lobes and the short (7–10 mm) flower tube distinguish this species. 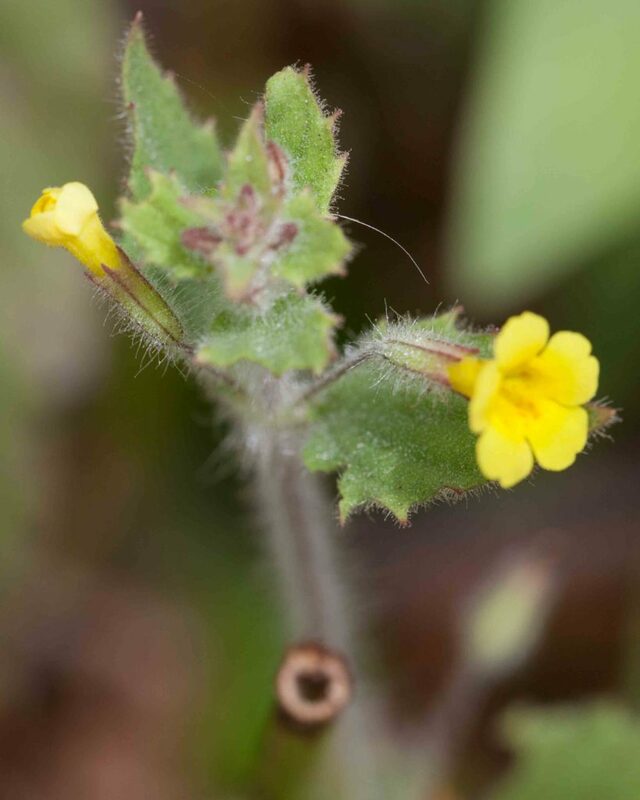 The calyx is ribbed, swollen and hairy, almost as long as and more or less enclosing the flower tube. 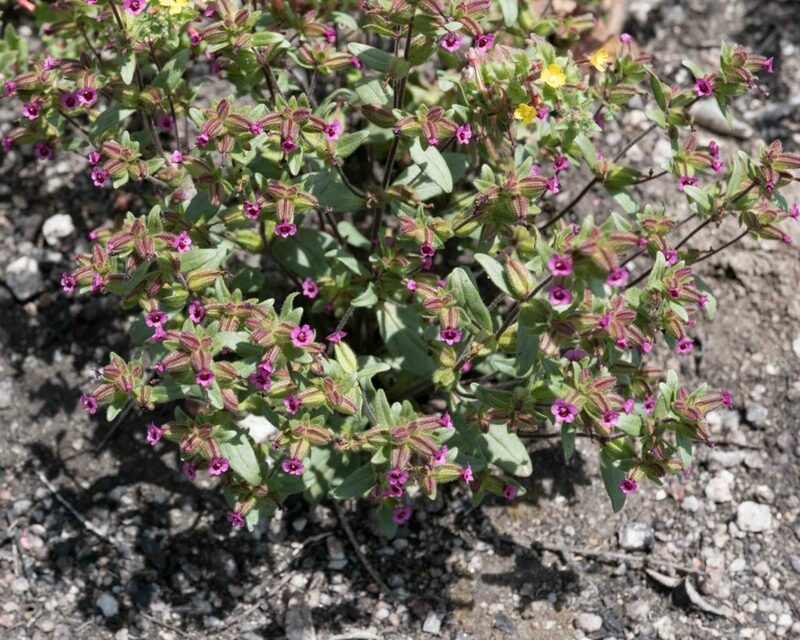 It seems that plants encountered in recently burned areas are noticeably fuller and larger than those found in areas that are merely dry. 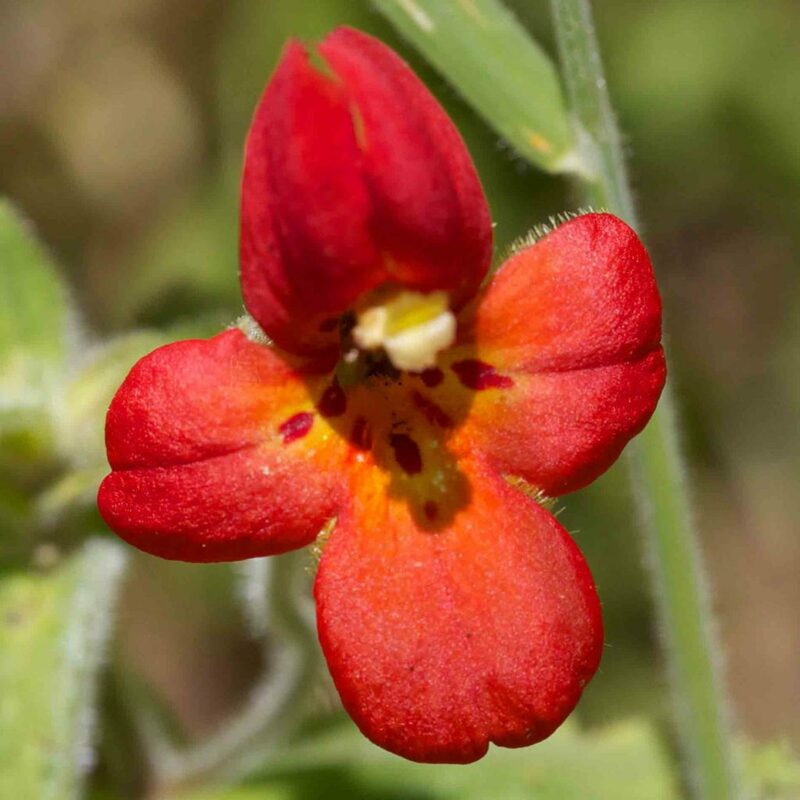 This long-pediceled bright red flowers of this monkeyflower are unmistakable. 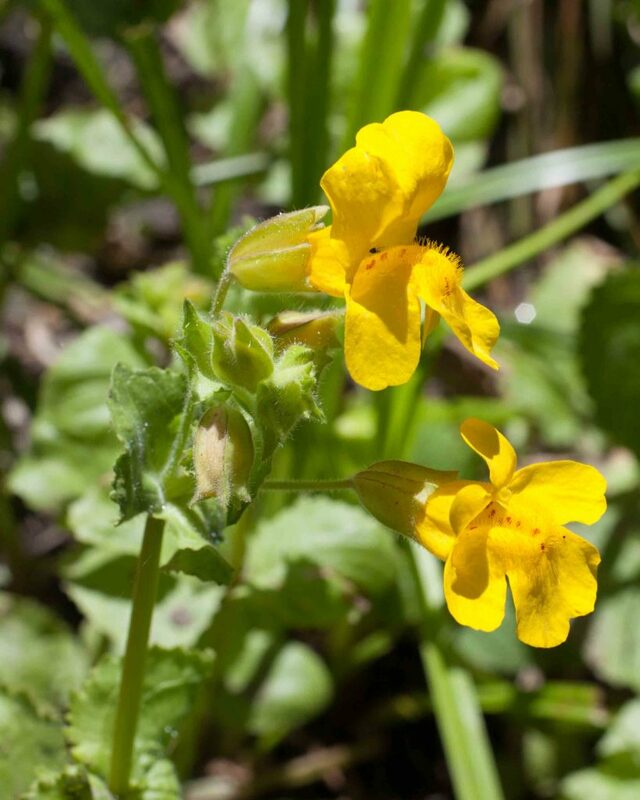 The two upper lobes are arched and the three lower ones sharply down-curved. The long tubular calyx is hairy. 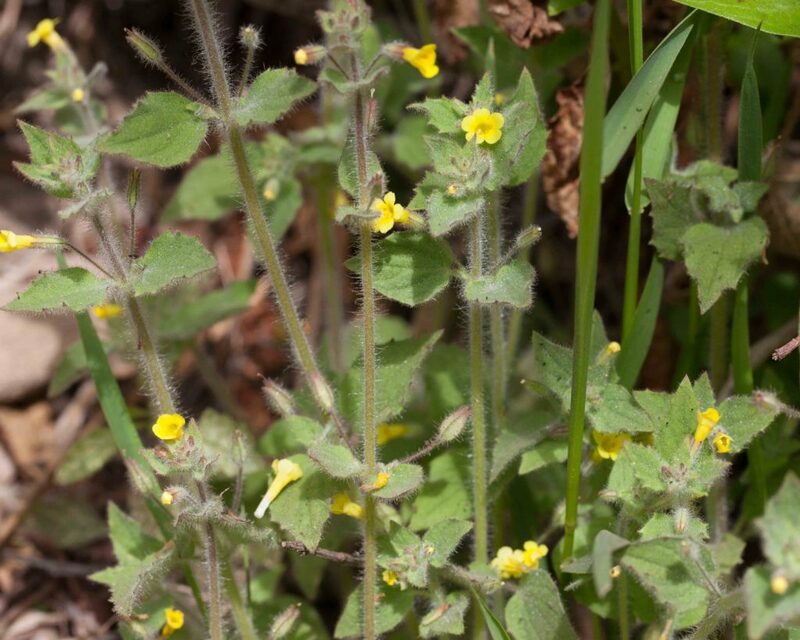 Leaves are large, toothed, opposite and light green, more or less clasping the stem. 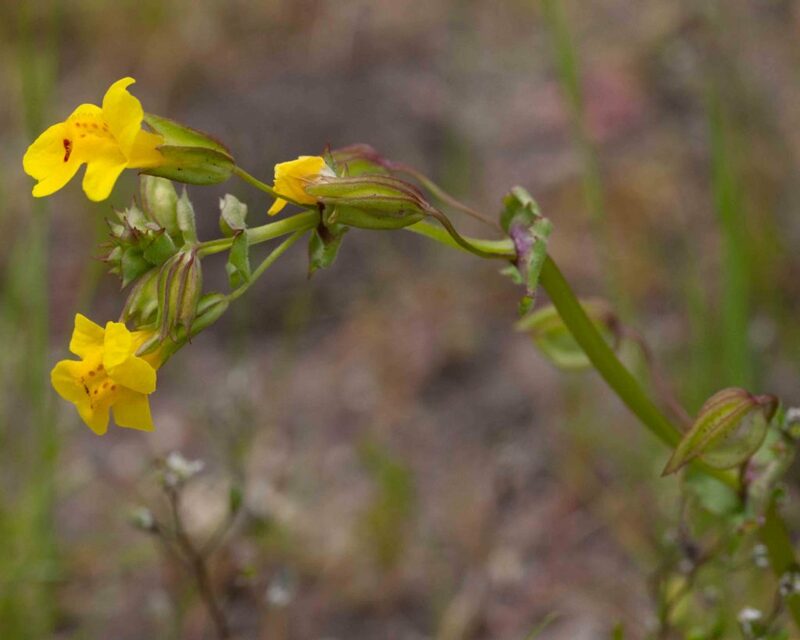 One of the more common monkeyflowers with distinctive long-pediceled, bright yellow flowers with red dots on its lower lobes. 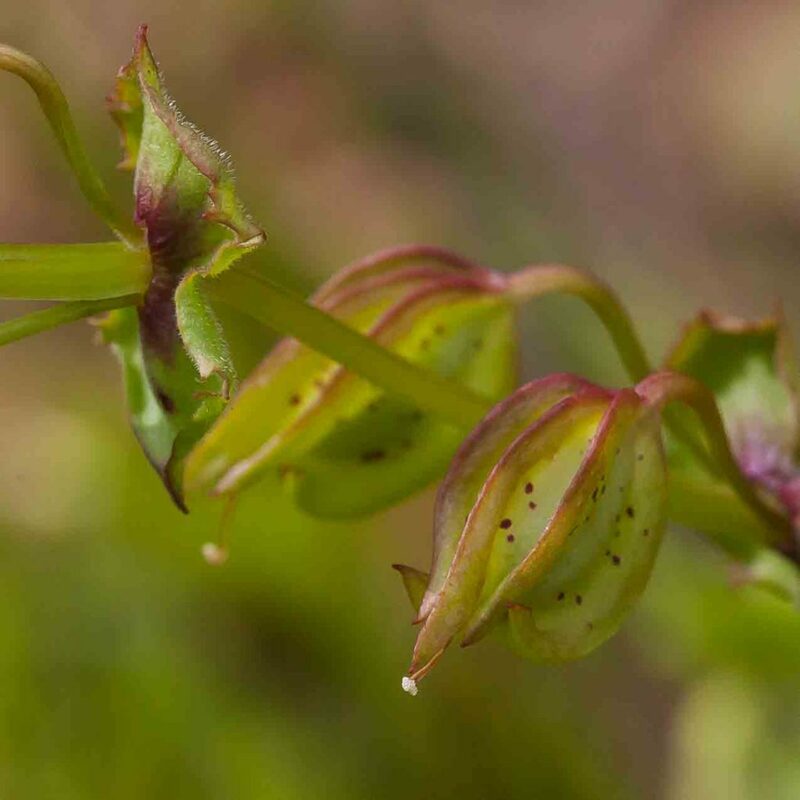 The bladder-like fruits are also distinctive. 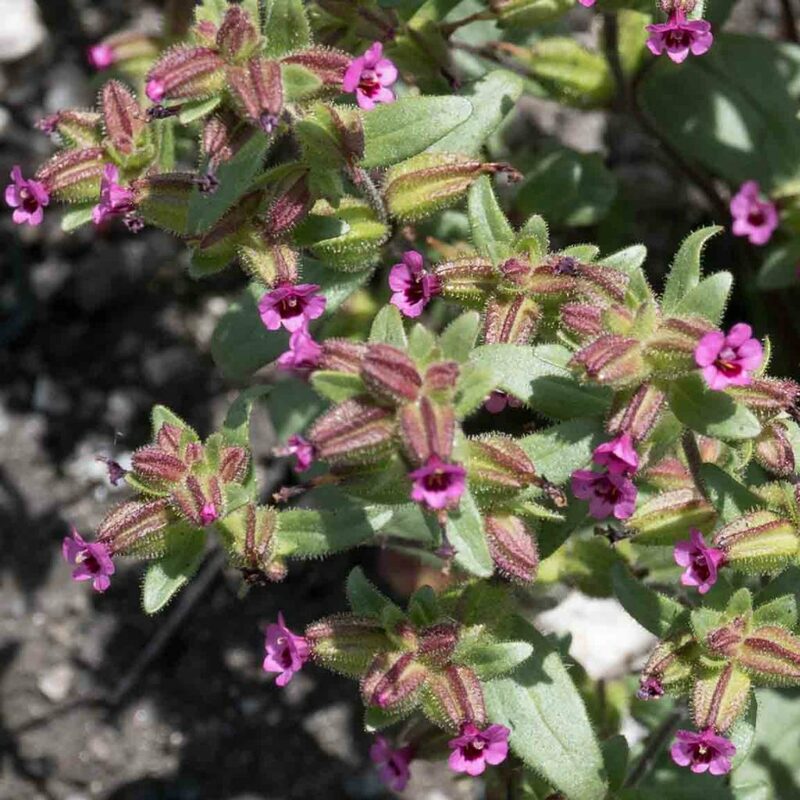 The leaves are clasping, glossy and rounded with a small-lobed or dissected base. 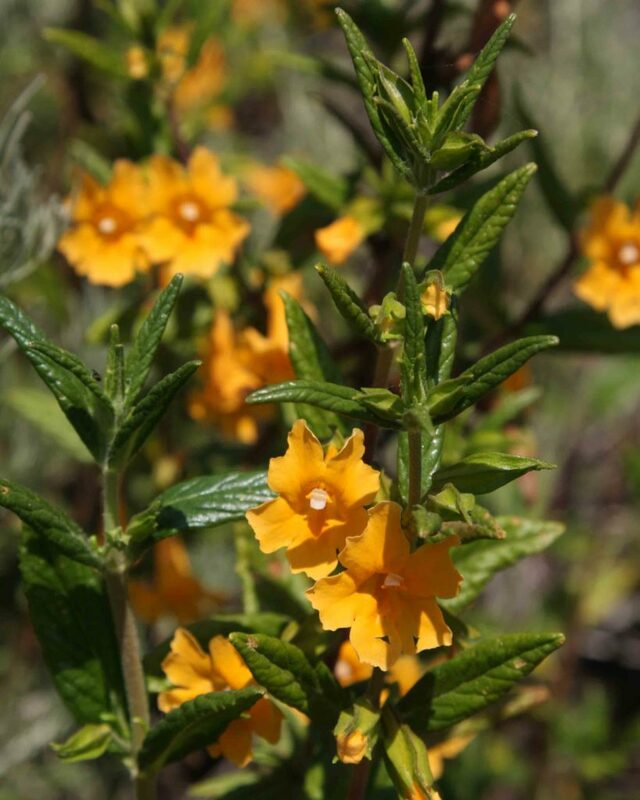 Often found in large quantities. 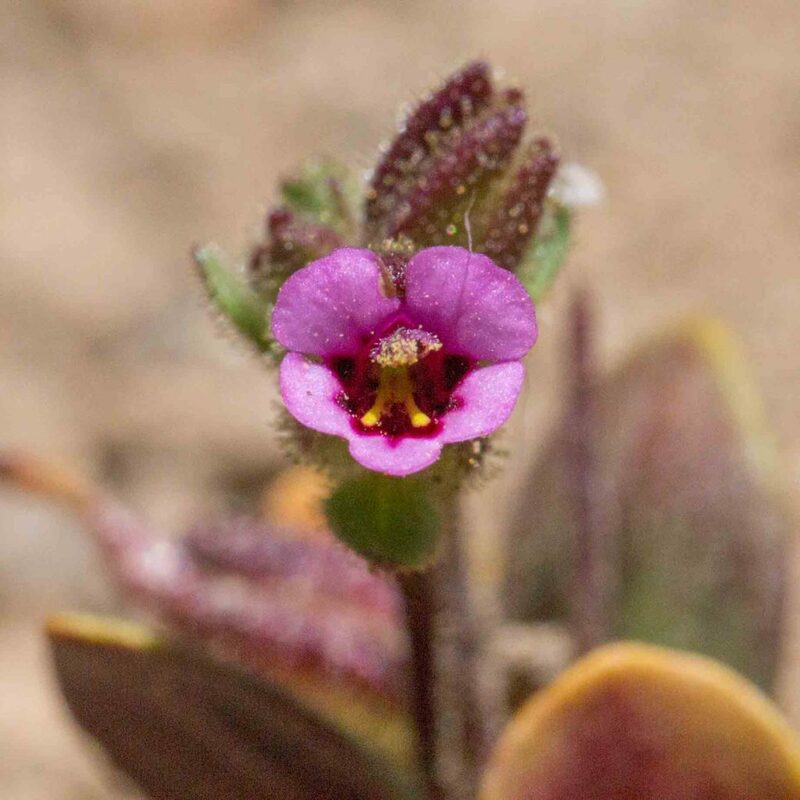 This has rather smaller, rounder flowers than Seep Monkeyflower (Erythranthe guttata), the tube-throat being only 6–15 mm long as compared to 2–40 mm and with smallish lobes. 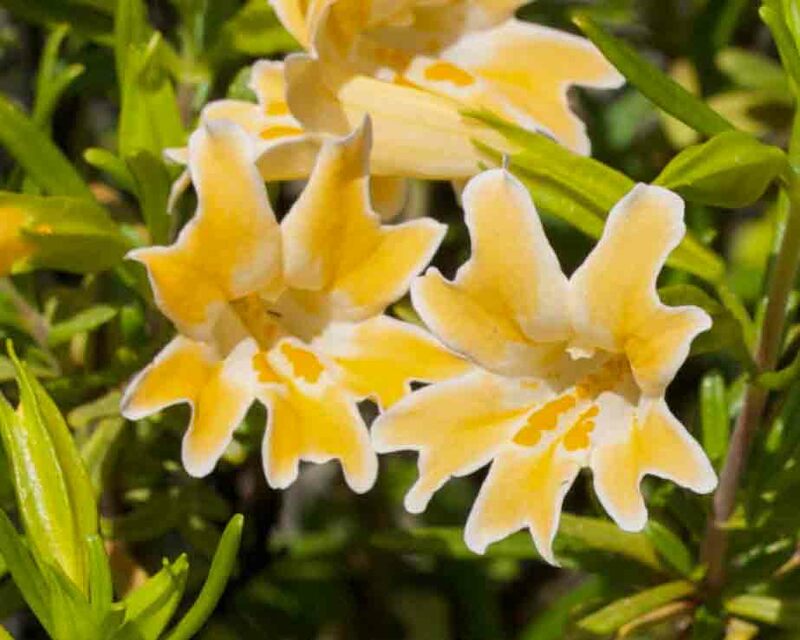 Peduncles and calyx are glandular-hairy. 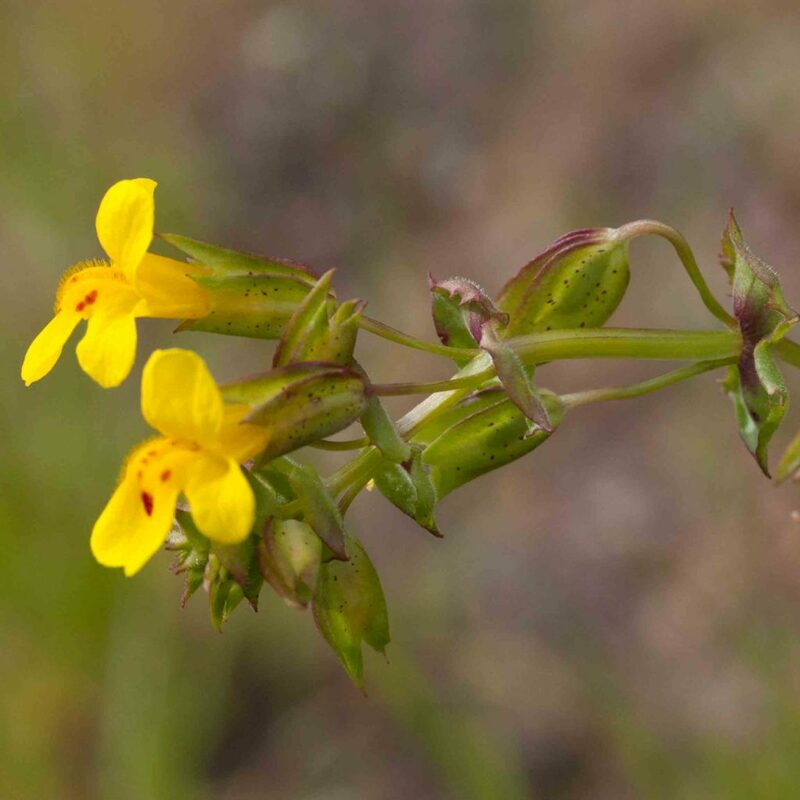 The Jepson Manual combines this species with Seep Monkeyflower (Erythranthe guttata) but more recent literature distinguishes it. 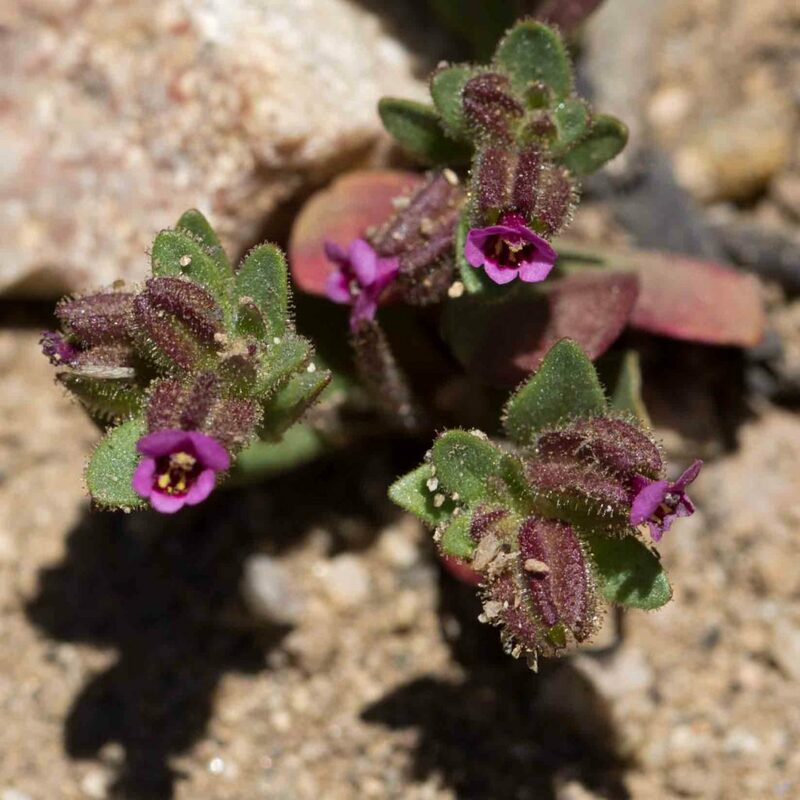 The plant is noticeably smaller, as are the flowers, the tube-throat being only 8–12 mm long. 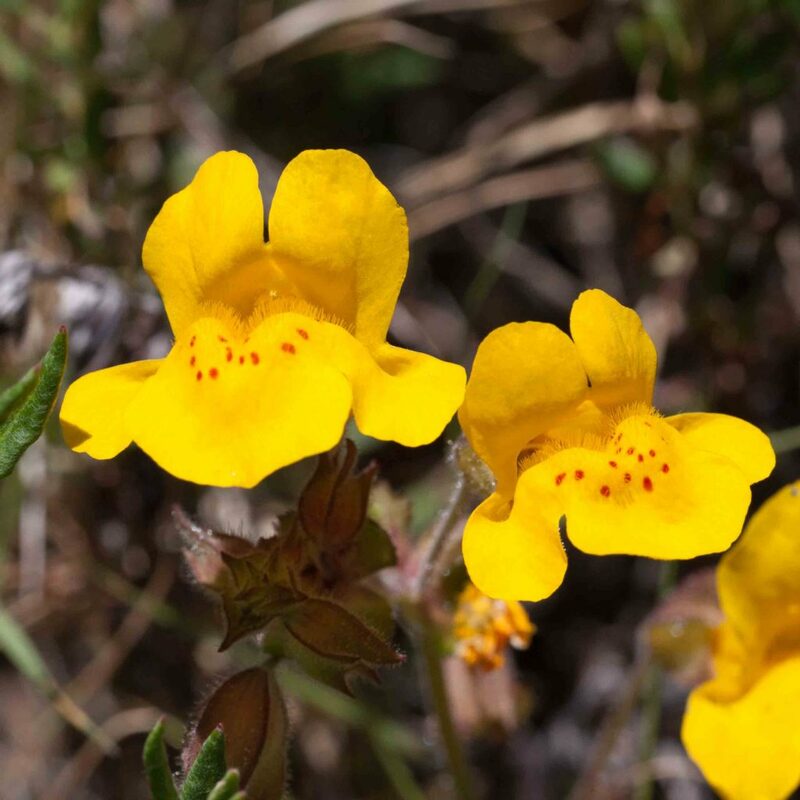 The flowers have a red blotch at the base of the lower lip rather than just red speckles. 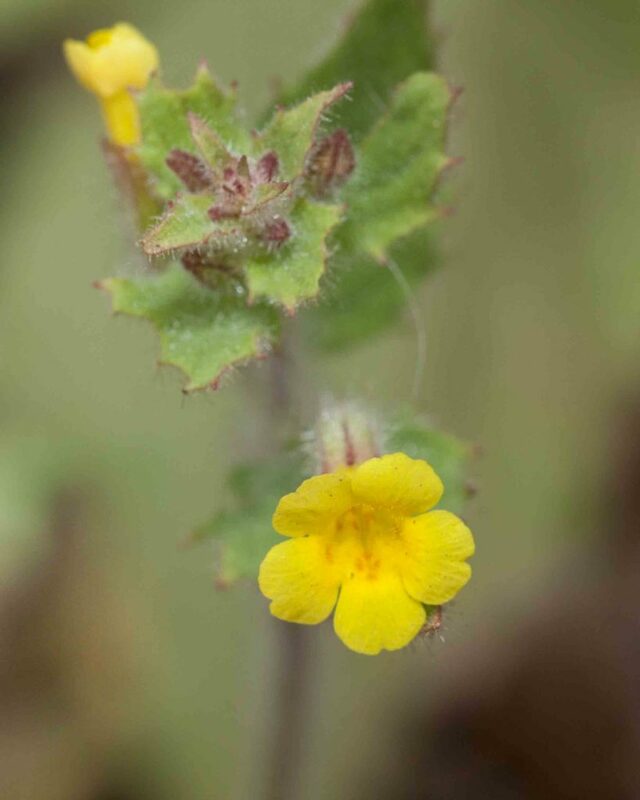 Most distinctive, however is how, in fruit, the upper calyx lobe protrudes prominently beyond the lower lobes in snout-like fashion — hence the scientific and common name.